Get ready for some fun this summer with Coach Brian Balocki and his dynamic staff! They will fill each day with sports and fun activities - kickball, tag-games, capture-games, ultimate frisbee, soccer, flag football, hockey, lacrosse, swimming, hiking, exploring, and cooperative challenges! 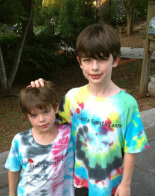 Atlanta Sports Camps is open to rising 1st thru 6th grade girls and boys. You may sign up for a single week session or multiple week sessions. Camp is held on Trinity School's campus. ​Monday and Tuesdays - Sports Days! Wednesday and Fridays - campers swim at Garden Hills Pool. Thursdays - campers explore Trinity Creek and play water games.